Buffering is a concept which has been around in networking since long. When we want to adjust the extra traffic without dropping it is known as buffering. The amount of holding the extra traffic varies from few micro seconds to seconds. More the holding time is deep the buffer is needed. The deep buffer means the extra traffic will be there in queue for few seconds and once the burst get cleared it will be served. The only advantage of deep buffer is to hold the peak burst for fraction of second but with this advantage we are getting one disadvantage also which is increase in latency. The more we hold the data traffic the more latency will be. If this is the case how OEMs are claiming that deep buffer switches will help you to build low latency data centers. As per my understanding, deep buffers will help to build high latency data centers. Deep buffers are only required if there is mismatch of transmitting and receiving interface speeds to hold the extra burst for few seconds. But if we are building a low latency data center with zero over subscription rate in that case there is no use of having deep buffers switches. Critical applications can’t show the performance with deep buffers because they always face latency due to the deep buffer delays. So it is important to understand the traffic flow while deciding will deep buffers really help for serving low latency applications or not. A data center fabric is a system of switches and servers and the interconnections between them that can be represented as a fabric. Because of the tightly woven connections between nodes (all devices in a fabric are referred to as nodes), data center fabrics are often perceived as complex, but actually it is the very tightness of the weave that makes the technology inherently elegant. A data center fabric allows for a flattened architecture in which any server node can connect to any other server node, and any switch node can connect to any server node. This flattened architecture of fabrics is key to their agility. What are the trends of Switching Fabric? In earlier days, Data Center Architecture was of 3 Tier architecture running spanning tree or layer 3 routing across the switches. The biggest problem was with these architecture was that only single path is selected and rest of the bandwidth got wasted across the network. All data traffic takes that best path as per the routing table until the point that it gets congested then packets are dropped. This fabric was not enough to handle the existing traffic data growths, with predictability and shift was required. Clos networks made existing complex topology made simple by giving name SPINE and LEAF in modern data center switching topologies. Data center networks are comprised of top-of-rack switches and core switches. The top of rack (ToR) switches are the leaf switches and they are attached to the core switches which represent the spine. The leaf switches are not connected to each other and spine switches only connect to the leaf switches (or an upstream core device). In this Spine-Leaf architecture, the number of uplinks from the leaf switch equals the number of spine switches. Similarly, the number of downlinks from the spike equal the number of leaf switches. The total number of connections is the number of leaf switches multiplied by the number of spine switches. If you have 4 spines and 8 leafs in that case you need to have 4 x 8 = 32 Connections. How Latency Is Getting Improved By Changing Data Center Switching? All of us aware that layer 2 switches are usually responsible for transporting data on the data link layer and performs error checking on each transmitted and received frame. The old generation or we can say the earlier used switches in the data center perform store and forwarding switching. In store and forwarding switching, the entire switch has to be received first and after that it is being forwarded. The switch stores the entire frame and does the CRC calculations before it forwards. If no CRC errors are present in that case switch forwards the frame else drop it. In case of CUT Through Switching, when the switch receive the frame it looks the first 6 bytes of the frame, then the switch checks the destination mac address , outgoing interface and forwards the frames. The all type of error calculations are done by the receiving device as contract to transmitting device in case of store and forward switching. Traditionally, TCP/IP protocol processing has been performed in software by the end system’s CPU. With the high packet load CPU also get busy in processing and unnecessarily increases the host latency. This is the latency which is being incurred by the host and not visible to anyone as no one cares about it. But with the help of Smart NIC we can offload the protocol and network process on NIC and is also known as Intelligent Server Adapter. This has been widely used in cloud data center servers to boost the performance by offloading CPU in NICs. Traditional NICs only support check sum and segmentation but if we have to offload the entire complex server based networking data plane which includes the SDN tunnel termination starting and ending point. The smart NIC has to be open and programmable; if it is not the case, it will become fixed and difficult to control and program by the SDN controller. Initially the packets and flows are handled by the host but as soon as the flow get detected it will be offload to Smart NIC. Typically, a SmartNIC includes larger memory on-chip or on the SmartNIC board to hold a much larger number of flows. From the above comparison, we can conclude that in case of Building Low Latency Datacenters, switching latency is one of the considered parameters but in today’s world switch latency difference between store-and forward and cut-through switching is negligible. Clos Latency can’t be negligible because it give the predictability and help to utilize all the available paths as compared to three tier architecture. Apart from these network latency has to be considered. Intelligent Ethernet NICs offload protocol processing from the application CPU thereby eliminating software performance bottlenecks, minimizing CPU utilization, and greatly reducing the host component of end-to-end latency. In Part-1 we learned about salt basics and its installation. 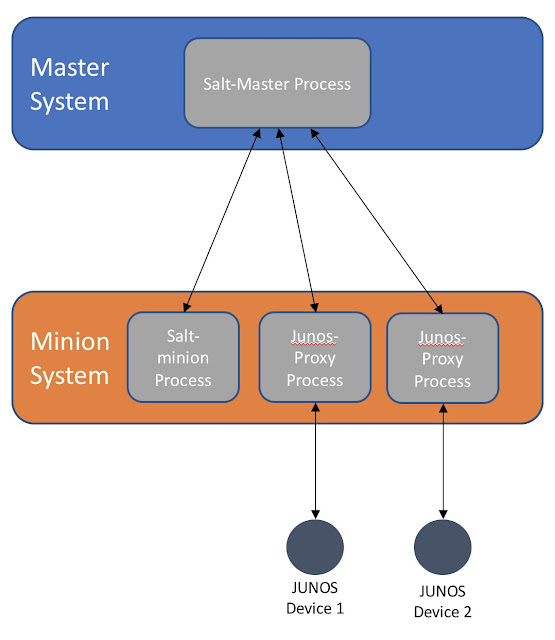 In this part we will focus on the working of salt and also talk about proxy-minion for Juniper devices. To start let’s begin with defining the master configuration on the master01 host. The interface with all zeros means that the master will listen for minion on all available and active interfaces. 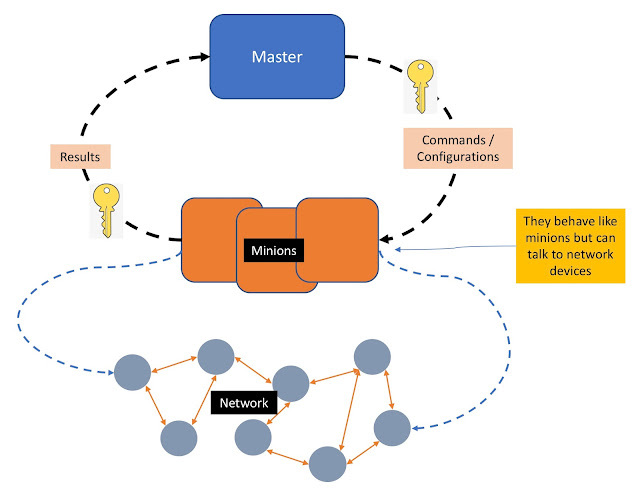 It is obvious, that it is possible to restrict the master to minion communication on a specific interface also by defining the IP address of that that specific interface. Master defines the IP address of the master and id is the unique identification of this minion. Master start Debug messages. Notice the authentication request from minion01. [DEBUG   ] Could not LazyLoad roots.init: 'roots.init' is not available. [ERROR   ] Unable to load SSDP: asynchronous IO is not available. [ERROR   ] You are using Python 2, please install "trollius" module to enable SSDP discovery. [DEBUG   ] Process Manager starting! [DEBUG   ] Grains refresh requested. Refreshing grains. [DEBUG   ] Please install 'virt-what' to improve results of the 'virtual' grain. [DEBUG   ] This salt-master instance has accepted 1 minion keys. Now lets run some execution commands from master to the minion. Please note while executing the command we need to specify the minion name. We can also define regex like ‘*’ means all minions and ‘min*’ means all minions whose name starts with 'min'. Notice the use of single quotes (they are mandatory). Salt also maintains a file server to distribute files from master to the minion. For security reasons, the minions cant have access to all the files on the master, instead of that we define one specific folder on the master configuration which minion can have access to. We can copy files from master to minion or vice-versa in this folder only. Proxy-minion is a very important feature that enables controlling devices that can’t run a standard salt-minion. As mentioned in the Part-1 the same minion will be acting as the proxy-minion for Junos devices in between the master and the network devices. Junos proxy provides the necessary plumbing that allows device discovery, control, status, remote execution etc on the Juniper routers and switches. Please note that for every Junos device we need a different proxy process. We can have multiple proxy-minion process running on the same minion device like the way in our example here. 1)	junos-eznc: The Juniper PyEz library. 2)	jxmlease: a Python module for converting XML to intelligent Python data structures, and converting Python data structures to XML. 3)	yamlordereddictloader: module providing a loader and a dumper for PyYAML allowing to keep items order when loading a file. 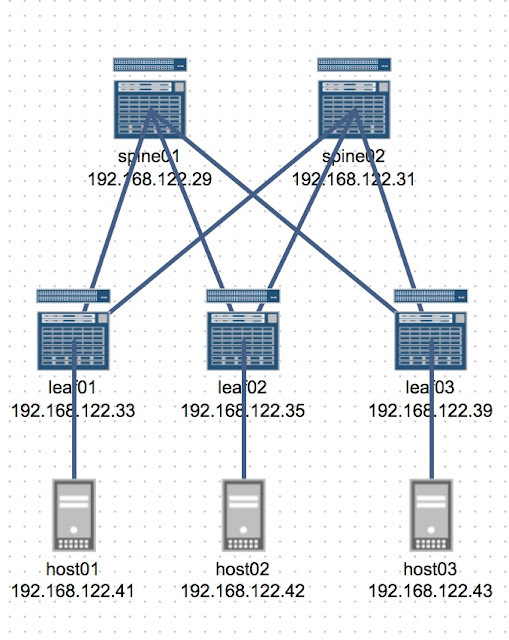 We will use Juniper virtual QFX as our network devices. This example will work in exactly the same way across all Junos based devices, right from smallest EX2200-C till the biggest PTX10K. Following is the topology for the virtual Network. This is example of a small Data Center with a typical spine and leaf architecture. For now that is all required to be done on the minion system. The above top file can be read as 'the category ‘base’ has minion ‘spine01’ for which data is stored in spine01 file'. Please note it is not required to have .sls extension to be defined here. Once again, it is interesting to note that all configuration is being done on the master system. Lets start the master process, the minion and proxy-minion prosses. The ‘-d’ represents that the process will be starting in the daemon mode. As mentioned earlier, the master and the minion is secured and they exchange keys. We can check which all keys the master has accepted. Router rebooted after a normal shutdown. As you can see we have a huge list of things collected. This is what happens on the vQFX. Please note that it is actually doing an rpc call to the switch. And the hostname is changed. Salt is easy enough to get running in minutes, scalable enough to manage tens of thousands of servers, and fast enough to communicate with them in seconds. Similarly, Salt can be used to manage network devices effectively. Salt has remote execution capabilities which allows us to run commands on various machines in parallel with flexible targeting system. In this post we will touch base on the basics of Salt and its installation. It is possible to have multiple minions to connect to a single master. 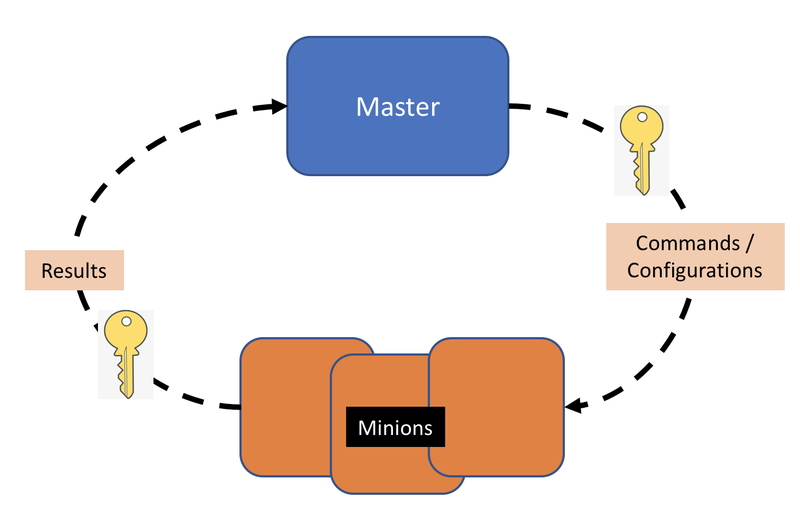 The communication between master and minion is secured and they use dynamically generated keys before anything else. The entire operational model is built on a dynamic communication bus which is ZeroMQ. Sometimes it is also refereed as pub-sub model. The salt system follows a very strict directory structure. By default the files are expected to be in "/etc/salt" folder and "/srv" folder. However, default directory structure can be changed. We will see the use of these folders in subsequent posts. There are a few more components which we will talk about in the future posts. Since network devices have propriety operating systems, hence it is not possible to make them minions. To resolve this issue, there is a concept of proxy-minion. In this case the master will talk to the network devices via minions. Now lets do the installation of both master and minion. For simplicity we will use one master and one minion. The same minion will be used later on as proxy-minion. Before beginning the installation, it is assumed that the user is familiar with Linux (Ubuntu / Centos etc.) and few other things like git and python-pip. We will be using Ubuntu 16.04 (xenial) for this installation. For other linux platforms, the installation will be very similar. Even though not mandatory, but it’s always better to have the master and minion to be synced to the same ntp server. Even though salt has its own repo on the github but we will use a forked version of the repo. The forked version is based on Nitrogen release of salt and it is available at here (https://github.com/vnitinv/salt). This repo is managed by Juniper. The installation of salt on both master and minion is identical. Hence for simplicity I am only showing it on master. We can check the Salt Version on both master and minion. For any questions please comment below. Telco’s user data traffic is getting doubled every year due to the proliferation of OTT video, social media, gaming and use of smart devices. This exponential growth in the mobile traffic has led lot of architectural changes which are aligned to SDN and NFV technology. At the same time OTTs are taking advantage because Telco’s are building network and serving 70% of OTT traffic only. At the same time, there is strong demand of serving OTT traffic with low latency, high throughput and best customer experience. To serve all these requirements, Telco’s has to penetrate deeper and deeper in the region and create more EPC locations which means number of new users are not increasing as compare to the traffic demands. During the launch of LTE, this was the best in breed architecture but as the traffic demands grow the intermediator or inline nodes are becoming bottle neck and creating head of Line blocking. CUPS - Control Plane User Plane Separation solves the issue and gave a new architecture approach which is easy to implement and leverages the SDN and NFV technologies so that all the SLA’s and KPI’s can be met. 1. Reducing latency on applications and OTT/Video traffic. 2. Leveraging SDN to deliver Data Plane more efficiently and better scaling in Control Plane. 3. Supporting Increase of Data Traffic, by enabling to add user plane nodes without changing the number of SGW-C, PGW-C and TDF-C in the network. Network slicing is a kind of virtual network architecture, which leverages the principles behind network functions virtualization (NFV) and software-defined networking (SDN). Network slicing allows telecom operators to slice a physical network into multiple virtual networks. From a mobile operator’s point of view, a network slice is an independent end-to-end logical network that runs on a shared physical infrastructure, capable of providing a negotiated service quality. The technology enabling network slicing is transparent to business customers. The virtual networks are then tailored to meet the needs of specific applications and services. SDN and NFV will play vital role in network slicing. NFV provides the network functions like routing, firewall, load balancer etc. disaggregate from the dedicated OEM appliance and can be host on COTS hardware. The OEM dependency on supplying hardware, elasticity and faster time to market is the key to leverage NFV. SDN on the other hand is use to manage the network flows from the centralized controller sitting in data centers. The main role of the SDN is to provide on demand services without any kind of manual intervention. 5G is all about of providing connectivity to massive IOT devices (Industrial Slice or IOT Slicing), enhance Mobile Broadband for AI, ML and handling Video Traffic (Smartphone Slice) and providing access to low latency devices like Cars (Autonomous Driving Slice). Network slicing will heavily be used in 5G networks to permit business customers to enjoy seamless connectivity and data processing tailored to the specific business requirements that adhere to a Service Level Agreement (SLA) agreed with the mobile operator. The customizable network capabilities include data speed, quality, latency, reliability, security, and services.